A video of a young pilot in, or rather, on, an 80-year-old glider has lessons for all of us who fly, writes Thomas P. Turner. Pilots, instructors, regulators, investigators and educators all lament the lack of basic airmanship demonstrated again and again in aviation crashes. From weekly general aviation crash reports through to high profile, regulation-changing events such as Colgan 3407 and Air France 447, we see the results of an apparent epidemic of missing or atrophied basic airmanship skills among pilots of all experience levels. The aviation industry is grasping at ways to address the high rate of fatal and near-fatal loss of control–inflight (LOC-I) events. The focus is on new technologies to help pilots ‘manage’ flight and avoid stalls. Flight management has its place, but it assumes basic aircraft control as a given. What collectively we’ve seemed to have forgotten is that we already have the answer to stall avoidance in our grasp. The answer is to focus on actually flying aircraft, and practise to ensure retention and improvement of those basic flying skills throughout your flying career. Recently, video (above) of an SG-38 primary glider in flight circulated on YouTube. This amazing video of flying in a replica 1930s primary glider contains lessons that apply to all pilots, from light sport through very light jet and beyond. The glider pilot is entirely dependent upon flying skills to survive. Come to think about it, that’s true in all aircraft. We have great safety devices—seat belts, shoulder harnesses, roll-cage cabins, crush zones, full-aircraft parachutes—but ultimately it’s the pilot’s basic flying skills and airmanship that determine the outcome of a flight. Analysing the pilot’s movements and actions in the video, you can see just how incredibly well he has mastered this absolutely most basic of flying machines. The pilot flies until reaching the maximum altitude permitted by the length of the tow cable, establishing a maximum climb angle of attack and holding that angle throughout the climb. When the pilot releases the tow cable, he pushes forward positively with the control stick, while holding heading with aileron and rudder. Going from an on-tow, maximum climb angle climb out to releasing the tow cable is the same as a sudden loss of engine power shortly after take-off in a powered aircraft. The lesson applies to us all: lose power in climb, and you must push down to the maximum glide (or in multi-engine aircraft, the single-engine climb) attitude, angle of attack and airspeed, and hold heading with whatever rudder and aileron input is needed. Essentially it’s this: in wings-level flight a neutral elevator (‘stick’) position maintains angle of attack (AoA), forward stick lowers AoA, and aft stick loads the wing and increases AoA. During the roll-in and roll-out of a turn it takes more changes in stick position to maintain angle of attack, but once the bank is established the aircraft doesn’t care which way is ‘up’ in coordinated, one-G flight except ‘up’ relative to the airframe. Therefore, the rules for stick-movement-versus-AoA in a constant-bank, one-G turn are the same as in level flight. If pilots do not do all these things, almost instinctively, they will not get maximum performance from the aircraft. In the case of engine failure (or flying a glider) that could mean losing control in a stall, or not making it to a suitable landing site. In normal flight it could mean less-than-optimal performance, unacceptably low performance at high weights and/or density altitudes, loss of directional control in the event of many abnormal and emergency situations, especially in multi-engine aircraft, and/or a stall/spin crash in any type of aircraft. Basic stick-and-rudder flying is that important. The US National Transportation Safety Board (NTSB) recently released its final probable cause report on the investigation of the crash of a Beechcraft King Air B200 at Wichita, Kansas on 30 October 2014. A solo pilot, delivering the aircraft to a refurbishment shop after it had just been sold, reported loss of the big turboprop’s left engine immediately after take-off. The aircraft turned left toward the dead engine through about 120 degrees of heading change before impacting in a fiery crash into a flight simulator training facility. The King Air’s pilot and three people in a Cessna Caravan simulator died in the intense fireball that followed. Two additional people in the simulator bay suffered extensive, life-changing burns; four others in the facility endured less serious injuries. Pilots justify the cost and complexity of twin-engine aircraft over high-performance singles for many reasons—payload, speed, and cabin size among them. But the primary reason pilots cite for moving from singles into multi-engine aircraft is the powerplant redundancy, the ability to fly out of an engine failure to an otherwise normal landing. Pilots justify the massive step up in cost and complexity of turboprop-powered aircraft for speed and pressurisation—but often because of the extreme reliability of turbine aircraft compared to piston powerplants. 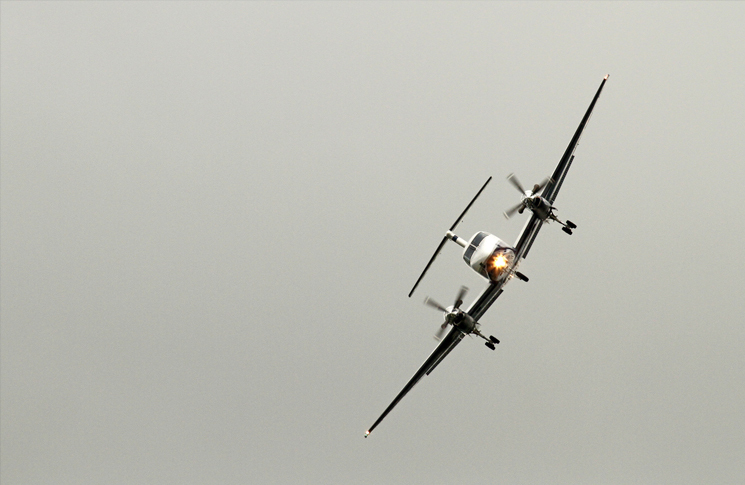 Most turboprops have mean times between failures in the tens of thousands of operating hours. It’s a reasonable expectation that even a full-time pilot of a turboprop aircraft could fly their entire career multiple times, back to back, and never experience a powerplant failure. The NTSB report states the King Air never got more than 120 feet above ground before descending, nearly wings level, but in enough of a slip that it was noticed by witnesses on the ground. The aeroplane’s gear remained extended throughout the entire, brief flight. Extensive fire damage prevented investigators from determining whether the propeller was feathered, or if the auto-feather and rudder boost systems—which automatically counter most of the effects of asymmetric thrust in the event of an engine failure—were even turned on at the time of the crash. The pilot’s failure to maintain lateral control of the aircraft after a reduction in left-engine power and his application of inappropriate rudder input. Contributing to the accident was the pilot’s failure to follow the emergency procedures for an engine failure during take-off. Also contributing to the accident was the left-engine power reduction for reasons that could not be determined because a post-accident examination did not reveal any anomalies that would have precluded normal operation and thermal damage precluded a complete examination. How could this be possible in a twin-engine turboprop? Because however unlikely, it still is possible. Single or twin, piston or turbine, the pilot’s required actions are well defined and actually quite limited when an engine quits immediately after take-off. The good news is that means pilots have only a few things to train for—they don’t have to make it up as they go. If the pilot is prepared, there is no immediate decision to make at the specific moment the failure occurs. Respond with the correct procedure; the time to make decisions comes (shortly) later. 2. HOLD heading with rudder and wings level. You push to attain the proper attitude for VBEST GLIDE or VYSE (‘blue line’) speed with a windmilling propeller. The proper attitude assures sufficient airspeed over the wings and control surfaces to prevent loss of control. I emphasise the push in push forward. Strict aerodynamicists will tell you that if the aircraft is properly trimmed when an engine quits, it will tend to nose down on its own to remain in one-G flight. This tends to maintain the angle of attack, preventing a stall. Unfortunately, there’s a pilot holding on to the control wheel or stick. Pilots are subject to what’s called ‘the startle effect’. …the result of a sudden shock that can disturb or agitate the recipient [and] can cause a person to have an involuntary physical reaction (e.g. jerking back on the yoke), can induce a significant emotional or cognitive response (e.g. fear, confusion or anger), or can simply cause a person to freeze in place. At least two and perhaps all three of those responses would cause the pilot to involuntarily try to maintain or even increase the angle of attack and reduce airspeed/increase induced drag in the seconds after the engine failure occurs…supporting a common loss of control result from an engine failure immediately after takeoff. Studies show the average reaction time to a startle event is 2.3 to three seconds. The time it takes for the pilot to make an input until the aircraft is roughly another two seconds. During these five seconds the angle of attack will have increased noticeably, and the airspeed decreased significantly…all before the pilot does anything with the controls. From this condition the pilot doesn’t need to simply relax the controls, they need to push to make the attitude right rapidly. Meanwhile the pilot needs to hold heading aggressively with coordinated rudder and ailerons. If you are faced with an engine failure close to the ground, no matter what aircraft you fly, you need do just these two things: push and hold. This provides the opportunity to make decisions and do more to assure your survival and that of your passengers and those on the ground. If you do not do these two things, swiftly and correctly, you will lose command of the aircraft’s flight path, and losing command of the aircraft is the first stage of loss of aircraft control. Watching the SG-38 video, I was filled with optimism that the pundits and the industry are wrong. Visualising and flying by angle of attack is not an art that’s lost to aviation history. 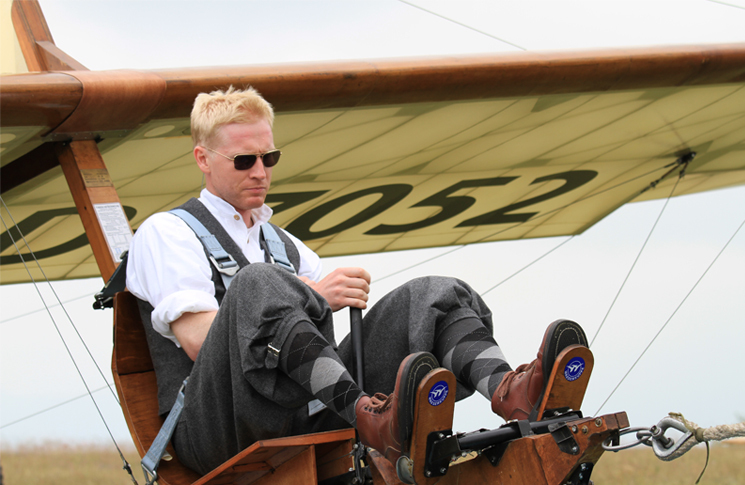 That modern pilot in a vintage glider is so artfully and skillfully flying the aircraft, visualising and manipulating angle of attack…with no instrumentation whatsoever. No airspeed indicator, no attitude indicator, no digital angle-of-attack indicator. It is still possible to truly fly an aeroplane, not just manage it. Take the time to learn and maintain the skills that are just as relevant to an Airbus or a Dash 8 as they are to a King Air, a Skyhawk, a Cirrus, or a replica vintage glider. Do this and instruments become the backups and advanced warning systems they are intended to be, not gauges to follow by rote in the hope they will somehow compensate for a lack of airmanship. Try these exercises to retain and improve your stick and rudder skills. Take along a qualified pilot or flight instructor to watch outside for traffic and afterward to critique your performance. Enter slow flight: From the US FAA, slow flight is ‘ …manoeuvring at the slowest airspeed at which the aircraft is capable of maintaining controlled flight without indications of a stall—usually three to five knots above stalling speed’. 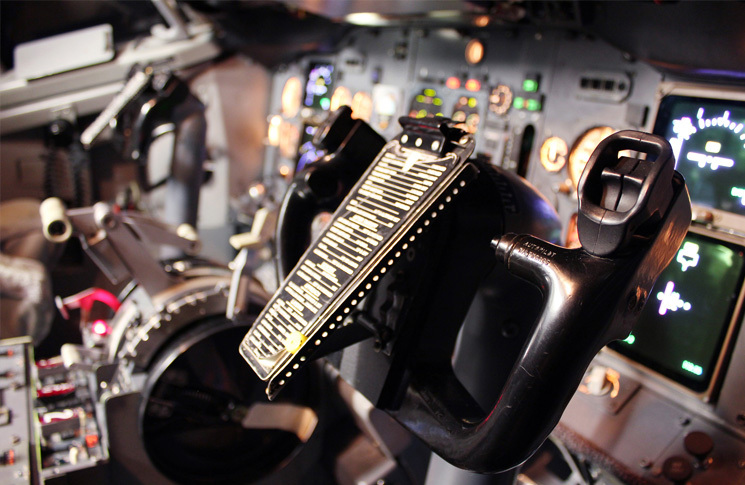 In slow flight, with the stall warning horn buzzing or light flashing, and if equipped with an AoA display indicating near-stall, trim and note the ‘neutral’ stick position once established on speed with the wings level and the slip/skid ball centred. This will be aft of ‘neutral’ for most cruise conditions. Make coordinated, shallow-bank turns left and right while holding altitude and airspeed. Note the need to move the stick to maintain altitude and airspeed as you roll into turns, but how you may need to remove some of that input once you’re established. Note the stick position change is less if you use power to manipulate angle of attack. Banking, add power; rolling wings level, return power to the level indication. At altitude, begin a landing-configuration descent at pattern speed. Note the ‘neutral’ stick position once established on speed with the wings level and the slip/skid ball centered. Using roads or other ground references, simulate the turn from downwind to base leg. Note the need to move the stick forward as you roll into turns, and to return to the neutral point as you roll wings-level on base leg, to maintain airspeed at one-G.
Simulate the turn from base to final and make the same observations. From your simulated final approach speed and configuration, execute a simulated go-around/baulked landing. Note the changing rudder, pitch and bank requirements as the power changes, the attitude changes, and you ‘clean up’ the aircraft. If you can’t do these exercises in the aircraft you normally fly, for example, you’re an airline or corporate jet pilot, rent a light training aircraft and flight instructor for an hour to go through the exercise. You’ll learn—or re-learn—something, and you may just find out flying little aircraft is still a whole lot of fun. Practise these exercise occasionally to reinforce angle-of-attack management at slow speeds, such as final approach and the initial stages of a go-around or baulked landing, and in traffic pattern turns during a glide toward the runway. Be conscious of this need to the point you unconsciously act it in your day-to-day flying … instinctively, like the glider pilot in the video. Kudos for a highly relevant article. It is well written, timely, on point, and offers valuable advice. You have not, however, addressed how to mitigate the most important contributor to this accident: The pilot’s expectation bias that kept him from promptly, aggressively, and correctly responding to the loss of one engine. His many uneventful hours and perhaps thousands of flawless takeoffs made it unlikely, perhaps impossible, to correctly respond to the emergency. While practicing slow flight, doing pretend engine failures in a simulator or aircraft might be helpful they won’t overcome or ‘reset’ the complacency that inevitably flows from our very reliable technology. I suggest we train, teach, practice, conjure mental images, reinforce muscle memory, prebrief in excruciating detail our actions WHEN the engine fails… Not IF it fails. How else can we be spring loaded with the correct response for every takeoff?